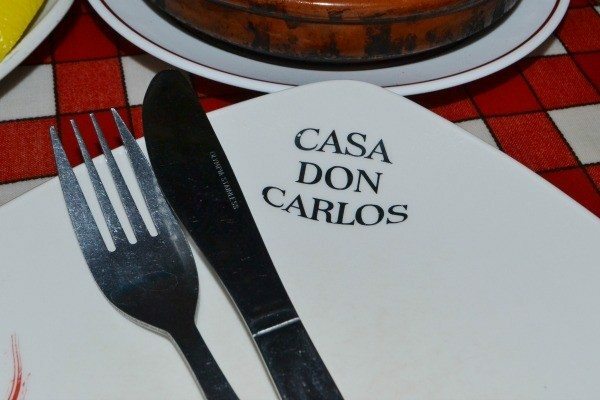 Declared as “the best spanish food in town”, Casa Don Carlos, a quaint spanish tapas restaurant tucked in the heart of the Laines sings traditional cuisine and distinct Mediterranean authenticity. 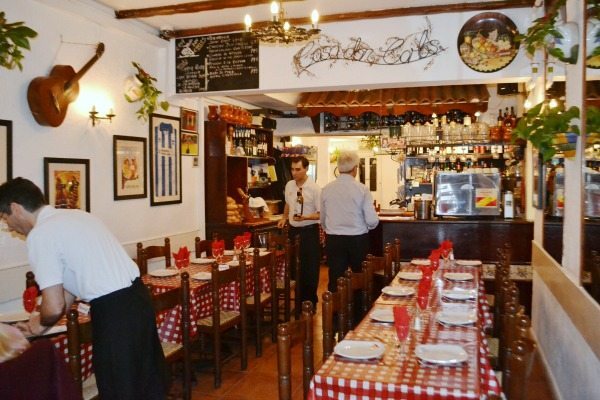 From its red and white checked table clothes, wooden beamed windows, and walls adorned with painted plates and hanging baskets – the place makes you feel as if you have stumbled across a cosy spanish home, tucked in the backstreets of Valencia. On a bustling Friday night, we were quickly ushered to our table by a jaunty spanish waiter, before studying the menu along with the specialities of the night. 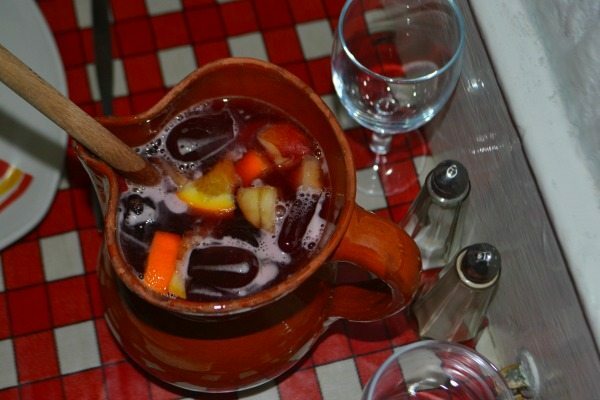 As the restaurant started to fill up with people happy to start the weekend, we thought it was only right to order a jug of Sangria to reflect the lively buzz that filled room. The Sangria arrived, served in a charming authentic clay jar which was delicately poured by the waiter. Acquainted by a delightful mix of red wine, juice and fresh fruit – the aromas and atmosphere started to feel reminiscent of a summer holiday far from the UK. The menu is laid out onto one manageable page separating the meat dishes from the vegetarian, and the appetisers from the larger mains. As we became excited and slightly overwhelmed with the options, the waiter generously gave his recommendations of the popular choices we should have. We decided to opt for five dishes between us, which is the ideal amount for two, along with a side order of garlic bread because we were told it tastes exquisite dipped in the Patatas sauce. Dishes came out intermittently, but with enough time to savour each one individually. 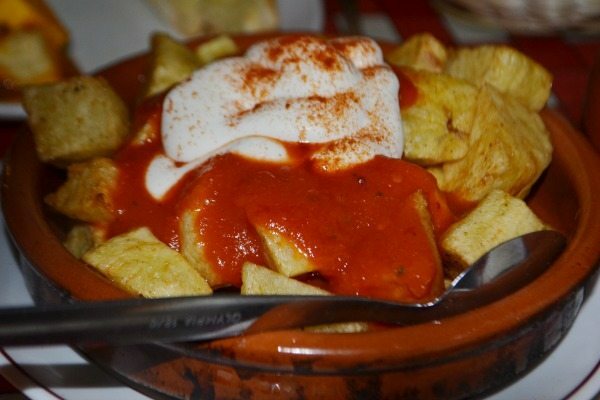 First up was the Patatas Bravas (also known as chilli potatoes), a dish native to Spain and a popular choice served in tapas bars. Soft and succulent, the potatoes were cooked to perfection, complemented with spicy tomato sauce topped with mayonnaise. You can’t go wrong with this dish, and if you’re a carb lover like me, it’s comfort food at its finest! Moving on to the Gambas aj Ajillo (spanish garlic prawns), which was our choice of fish out of the five. The prawns came out sizzling hot, and looking beautifully seasoned in a shallow bath of oil, garlic and herbs. The meat was tender, juicy and equally had a lovely punch of flavour. As well as being perfect on its own, it still wonderfully complemented the other dishes. Garlic prawns can be done well, but flavoured badly, and without a doubt, it delivered the right combinations of taste and texture in one bite. Sizzling in a spanish clay pottery dish lies the succulent chorizo and tasty stew, which made us both “ooo” in unison as it was arranged with the others on the table. 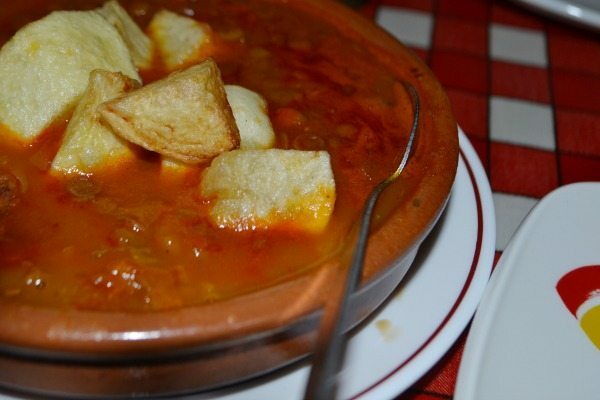 This is a warm hearty authentic tapas dish to die for. The lentils were tender, and the large chunks of chorizo had a punchy zing of spice. It was reminiscent of an indian dhal, only with a marriage of Mediterranean flavours. If you’re a meat lover, I would definitely recommend this one. This dish was a recommendation by our waiter. Although I have never been a great lover of veggie food, I was pleasantly surprised when I tried this. 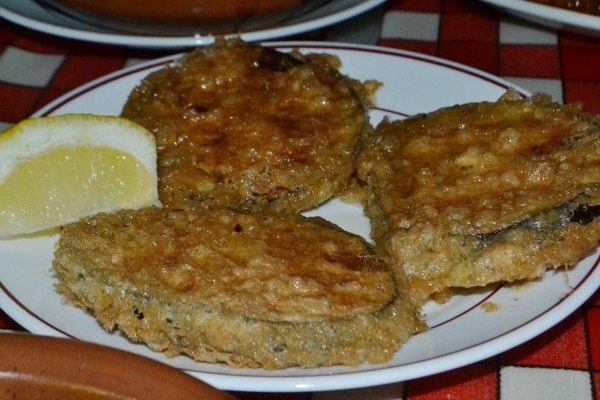 The round slices of Aubergine covered in a crispy, bubbly coating of honey definitely got my taste buds tingling, and I was left having a new lease of love for veg. It had an interesting taste of sweet and savoury, and became one of my favourite dishes of the night. The main dish we decided to savour was the Paella – we both love this dish, and were curious to taste it authentically cooked. 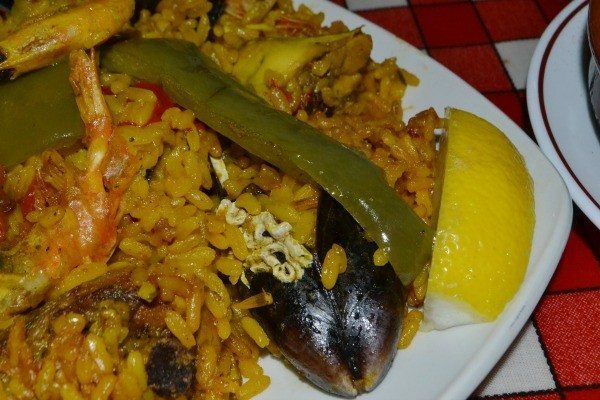 The paella came with a sunny med mix of rice, peppers, chicken and shellfish including prawns and muscles, and from looking around, it seemed to be a firm favourite with others. It was light in size, but quite perfect having as the last dish in our tapas feast. It smelt and looked as if it had be transported from a beach restaurant from the Mediterranean coast, and tasted like the real deal, a creamy combination of rice an meat which was again cooked to perfection. The fish was fresh, added with just the right amount of flavour. It delivered an understated, simple yet hearty dish to finish off an indulgent sitting. 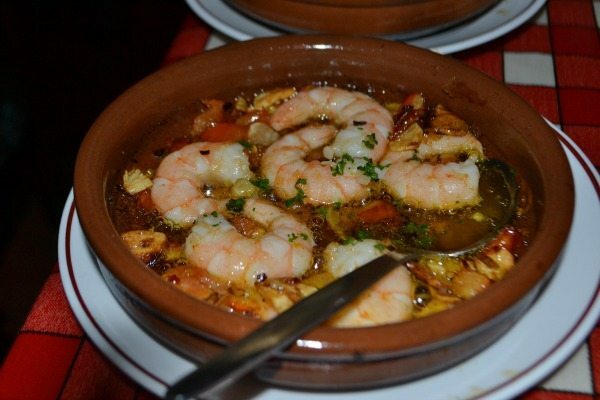 If you’re looking for spanish cuisine at its best, Casa Don Carlos delivers just that. The ambiance, service and food equates to a spanish experience brought to the heart of Brighton. The pleasant thing about tapas is that you have an endless choice of dishes – olives, bread, meats, and fishes, which is great if you fancy a bit of everything. Also having a tapas is perfect to do with friends, as you can share the experience of sampling the dishes together – a fun friday night out for anyone. Towards the end, we were full to the brim and almost couldn’t finish the last of it…with tapas, its ideal to start with a few dishes, and then order more as you go! If you’re thinking of heading to Casa Don Carlos (especially on a friday or weekend) we would highly recommend booking in advance, because the restaurant fills up quick – and obviously with good reason!